The Zero waste coordinator Highland Perthshire, set about to help and coordinate a litter pick on the shores of Loch Rannoch after requests came in from the Loch Rannoch Conservation Association Wardens and the Rannoch and Tummel Tourism Association. Having the equipment that is needed I couldn’t resist in joining in! The finished boxes, all with their own “identification” markings. The Zero Waste Highland Perthshire Officer and the Bike Station in Perth have set a challenge to the Highland Area Ranger to recycle tyres from bicycles! Not the inner tubes but the actual tyre! In return a large amount of inner tubes from bicycles will be provided to put up bird boxes in two parks (Pitlochry recreation ground and Memorial Park in Blair Atholl). With the challenge set, Jeannie decided to use the tyres cut up in sections as hinges of the bird boxes made at the Gala Day at Pitlochry recreation ground and at the Cairngorm Park Nature Festival weekend in Blair Atholl. Road bike tyres worked fine but mountain bike tyres were too chunky! So with half of the challenge completed the thinking cap needs to go on how mountain bike tyres can be recycled! Location of St Mags Car Park, top of Glendevon Road. Come and join us planting oak trees on St Magdalene’s Hill, Perth on Thursday, 17th March at 10am. Meet at the car park at the top of Glendevon Road (see map). Stuart’s family have been collecting acorns from old street trees over the last few years and we have been using them to increase the number of oaks in the woodlands on St Magdalene’s Hill. So far we have planted several dozen and there are about 50 more to plant. We will need to construct some protection, so you can get creative, if you like. St Magdalene’s Hill is a big site with a lot of interest and I look forward to seeing you there next week if you can make it. THIS EVENT HAS BEEN POSTPONED. FURTHER DETAILS AND DATE WILL BE RELEASED IN DUE COURSE. Room to Roam in Crieff – thank you volunteers! 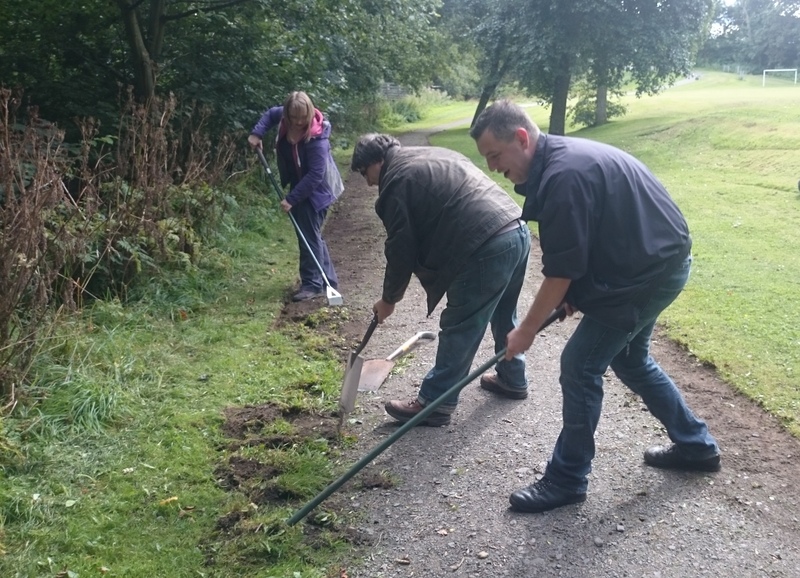 A huge thank you to the Crieff Community Greenspace Volunteer group who were out last week widening the surface of a well-used footpath. Vegetation had grown over the paths edges making it narrower than it used to be. Crieff Community Greenspace Volunteers group is a run in partnership with the NHS and aims to help people get active outdoors to reap the many health benefits that green spaces have to offer. 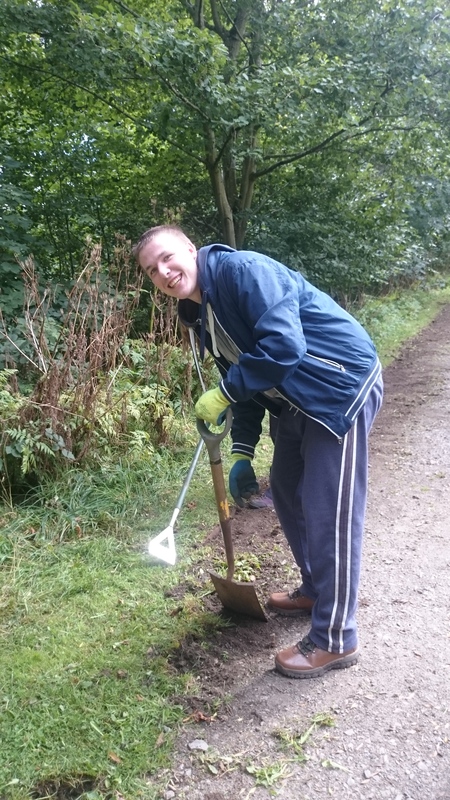 Andrew from the group is using this experience to help achieve his Duke of Edinburgh Award.